Caroline Guitar Company Parabola Solid State Tremolo - IN PRONTA CONSEGNA! 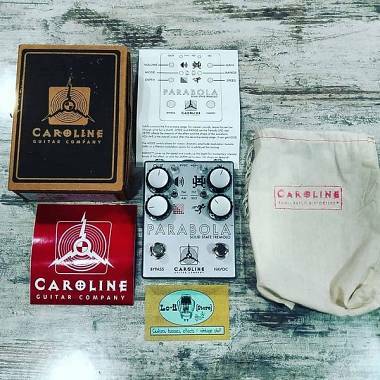 Finlamente disponibile il nuovo "Parabola", Tremolo Solid State Handmade in Columbia, South Carolina USA! The PARABOLA is a solid state, transistor generated waveform tremolo. The oscillator is strongly influenced by the vintage Schaller TR-68/TR-316 “West Germany” tremolo pedals that CGC fell in love with in the 1990s. They have a gorgeous analog waveform that actually changes shape with the depth control, and a feel that is unlike anything they’d ever played before or since. Beyond a faithful approach to the transistor LFO, there are a host of improvements Caroline made. The Parabola’s volume control has more than enough output to compensate for any perceived volume loss of the tremolo effect – in fact, it’s up to +12db of clean gain – AND there is a gorgeous preamplifier drive stage based on the “invader” preamp of our Kilobyte and Météore pedals, so you can crank the gain and generate drive at any volume. 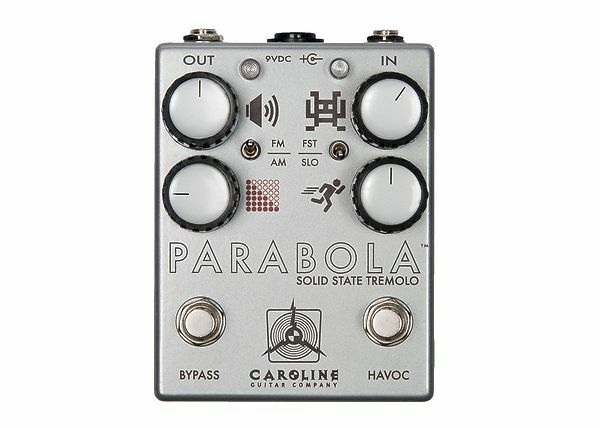 You can think of the Parabola as an additional “tremolo channel” for your setup. The AM mode is the classic Schaller amplitude modulation, gorgeous and wobbly, like sloshing through deep puddles with your rain boots on. The “FM” mode is a frequency dependent ‘filtered’ mode based on the depth control that manages to create a shimmering effect that gets out of the way of your playing. The Speed, Fast/Slow, and Depth ranges have been improved both from the (often incorrect) Schaller schematics people post online and the real deal vintage TR-68s they traced, and the Depth can be easily zero’d out to allow you to just use the gorgeous preamp and booster. And the Havoc “inverts” whichever speed range you’ve chosen and opens up the depth control, so you can momentarily “juice” or “drag” the effect on demand.